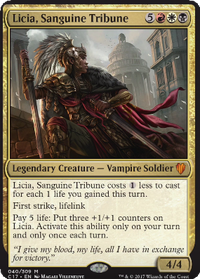 Drana's Emissary , Agent of Masks , Merciless Eviction , Silence the Believers , Blood Artist , and Resplendent Angel are really good here and shouldn't cost you too much. Hexaflexagon on Advertise your STANDARD deck! This deck is a deck built around the Resplendent Angel + Lyra Dawnbringer combo, with some other beaters just in case you don't get the combo going. Love the deck! +1. Ever thought of Resplendent Angel ? At worst, it's a 3/3 flyer for 3 that can be gotten thru CoCo and might soak up a piece of removal. My comment is incoming 9-lives! 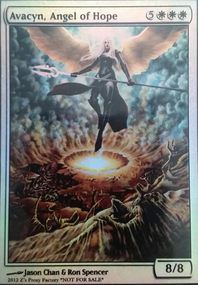 Hey, I see Avacyn, Angel of Hope . 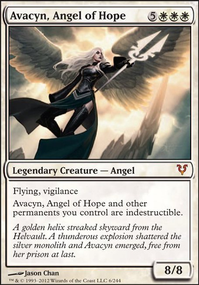 Why not use her as Commander instead of Avacyn, Guardian Angel? Angel of Hope is a much better card; much more impact as a Commander. There's several cards in the sideboard that are upgrades for cards in the main deck. 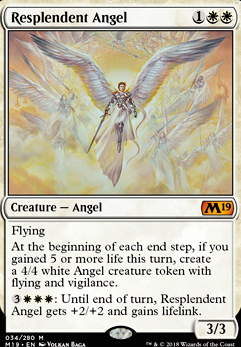 Resplendent Angel and Lyra Dawnbringer can be a fantastic Angel engine in multiplayer Commander because Resplendent works on each of your opponents turns. These are two of the best Angels for Angel tribal; alone or together they have a lot of impact. Angel of Serenity and Baneslayer Angel are two more of the better Angels. Because Serenity is a creature it can be recurred or reanimated this makes it a very good repeatable creature/graveyard hate removal spell. Herald's Horn , Urza's Incubator and Caged Sun are all upgrades for ramp. Serra Ascendant for one mana can be a real beating in 40 life Commander. Consider Angel of Sanctions ? It's an Angel Oblivion Ring that can be more easily reanimated. My next suggestions are good support cards for mono white. Consider Smothering Tithe ? 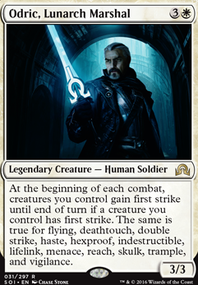 It's a great source of repeatable ramp for white in multiplayer Commander. 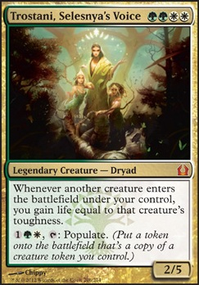 Wheels can be a big part of some Commander matches and this card gives you a huge advantage against your opponents. Everyone in Commander wants to draw sometimes even a lot of cards and every time an opponent does they are not going to want to spend two extra mana for each draw just to deny you a treasure. Consider Knight of the White Orchid , Mother of Runes and Aven Mindcensor ? Ramp and repeatable protection. Mindcensor makes your opponents tutors less effective even Fetch lands which is very helpful for you because white lacks tutors. Mindcensor helps to some what level the playing field. With Angel of Hope as Commander you can take advantage of Hour of Revelation and Akroma's Vengeance which will wipe everything of your opponents and not yours. Armageddon also nasty when your lands are indestructible. Sphere of Safety: only 8 total enchantments is not enough to utilize this for five mana. Angel of Invention: Angels are already big with evasion don't really need a five drop +1/+1 anthem. Pristine Angel: 4/4 for six mana who may or may not have protection is not worth it. Angel's Trumpet: this gives your opponent's too much advantage with creatures in multiplayer. oh oops theres Resplendent Angel , but that doesn't really change my point. 2 cards versus 1. still nothing to be concerned about. these cards likely grant vigilance because the effort required to make the token is higher, therefore the token is better.